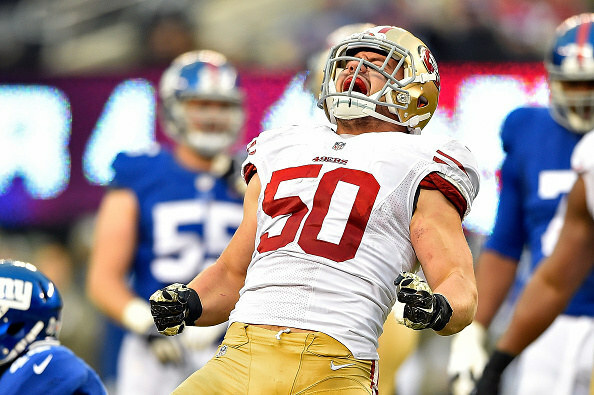 Chris Borland, a 24-year-old linebacker for the San Francisco 49ers, has decided to retire from football after only one season over concerns about the effects of head trauma, ESPN reports. From what I’ve researched and what I’ve experienced, I don’t think it’s worth the risk. I feel largely the same, as sharp as I’ve ever been, for me it’s wanting to be proactive. I’m concerned that if you wait till you have symptoms, it’s too late. … There are a lot of unknowns. I can’t claim that X will happen. I just want to live a long healthy life, and I don’t want to have any neurological diseases or die younger than I would otherwise. According to ESPN, Borland met with a team of experts, and considered the lives of former players who were diagnosed with Chronic Traumatic Encephalopathy, a degenerative brain disease that causes dementia-like symptoms and is strongly linked to repetitive brain trauma. The decision comes after a standout rookie season for Borland, who recorded two interceptions, one fumble, and 84 tackles. He also looked to be a promising replacement for linebacker Patrick Willis, who retired last week at the age of 30. His decision, and the plain language he used to describe his concerns over the effects of repetitive brain trauma, represent the NFL’s worst fears. Due to his young age and ability, Borland’s decision signifies somewhat of a turning point in the social awareness of the risks to players. Though it is tough to imagine a reality in which the NFL will not have an endless pipeline of talent who would do anything to make it on a roster, Borland’s decision will undoubtedly send a signal to players, parents, and possibly, the league. While unexpected, we certainly respect Chris’ decision. From speaking with Chris, it was evident that he had put a great deal of thought into this decision. He was a consummate professional from day one and a very well respected member of our team and community. Chris is a determined young man that overcame long odds in his journey to the NFL and we are confident he will use the same approach to become very successful in his future endeavors. We will always consider him a 49er and wish him all the best.